I. Advocate for and promote the culture of obedience to Court Orders and compliance with the principles of Rule of Law. II. Monitor, identify and condemn cases of impunity and executive lawlessness in Nigeria and take active steps to ensure the remediation of such impunity. III. Advocate for access to justice by facilitating pro bono and quality legal defence and representation for certifiably poor and vulnerable persons. As a corollary thereto, re-activate and upgrade the NBA Pro Bono Scheme so as to achieve the objectives for setting up the scheme. IV. Advocate for the respect and protection of human rights of citizens and tackle gender inequalities wherever they exist or are being perpetrated. V.	Develop and advocate for programmes and projects relating to prison decongestion in Nigeria. VI. Launch an NBA Annual Human Rights Report. 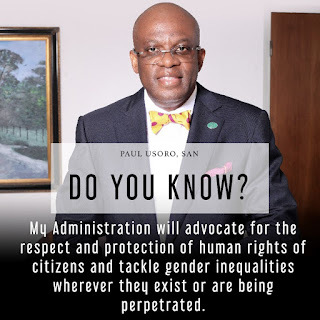 This would be achieved by monitoring and documenting cases of human rights complaints and violations through NBA human rights committees at NBA branches, the media, and other human rights stakeholders. This would help us determine the frequency (increase or decrease) of human rights abuses in Nigeria. VII. Advocate for the approval of the National Action Plan for Human Rights in Nigeria by the Federal Executive Council. VIII. Develop and enforce procedures for swift responses to national issues and in this regard, hold monthly press briefings on national issues. IX. Institutionalize conflict resolution, gender and peace advocacy. X. Propose comprehensive constitutional reforms with regard to the 1999 Constitution of Nigeria, as amended, especially as it relates to the Judicature. d.	Enhance access to justice and the protection of the rule of law. e.	Strengthen financial autonomy of the judiciary. XI. Advocate for the domestication and implementation of the Administration of Criminal Justice Act, 2015 at State levels in Nigeria. XII. Develop a much improved and comprehensive Legislative Advocacy Programme for the NBA. XIII. Champion the reform of Justice and Accountability Institutions for better service delivery.